This 1.5 CEU workshop will be presented by Melanie Gordon Sheets, Ph.D.
from 10:30 – 12:00 pm on Friday, Sept 23th, 2011. This workshop will provide an introduction to the workbook based DBT-CBT recovery program, a modified DBT program for individuals with affective disorders, personality disorders, and destructive coping behaviors, such as substance abuse, self-injury, suicidal threats, verbal/physical aggression, eating disorders, overshopping, etc. Some key recovery concepts, skills, techniques, and understandings will be discussed and several program worksheets will be reviewed. Dr. Sheets will be presenting on the DBT-CBT Workbook program at the North Texas State Hospital Forensic Conference in October, 2011. Details will follow. TAAP is a state affiliate of the national organization, “The Association for Addiction Professionals” (NAADAC), formerly known as the National Association for Alcoholism and Drug Abuse Counselors. The name change reflects the increasing variety of addiction services professionals: counselors, administrators, social workers and others, who are active in counseling, prevention, intervention, treatment, education and research. The “Cycle of Suffering”- when we respond to emotional pain and life problems in destructive, emotion-driven ways, we end up with new problems and increasingly severe old problems…and we feel worse than before. If we respond to this new level of pain and problems in destructive ways, our pain and problems will continue to intensify and multiply. Because we’re not working through our pain or resolving our problems, our emotional baggage piles up. The trauma from the past weighs us down in the present and intensifies present misery. What could have been temporary pain and problems has turned into long-term pain and suffering. The only way to get the cycle of suffering to stop…is to stop it. We can stop our suffering by stopping our destructive coping behavior. We must turn on Rational Mind to “think through before we do” and we must “follow through” with Wise Mind problem-solving and life-enhancing coping behaviors. NAMI Midland, Permian Basin Community Centers, Midland College, and the Odessa College Psychology/Sociology Department proudly sponsors, “Tots, Teens, and Troops: Mental Health in 2010” on September, 23rd, 2010. This workshop will be held at the Midland College Advanced Technology Center located at 3200 West Cuthbert in Midland, Texas. 8 CEU’s will be offered to conference attendees. The workshop opens at 9 A.M. with a keynote speech by Dr. Virginia “Ginger” Hilley addressing professional well-being. Dr. Hilley is a psychologist at Big Spring State Hospital. Dr. Melanie Gordon Sheets will be presenting the co-occurring disorders training on treatment of individuals with mental illness and substance abuse problems. Dr. Sheets is the Chief Psychologist at Big Spring State Hospital and has been a clinical psychologist in Texas since 1992. She has published a workbook based on the DBT group therapy program at the hospital. This group provides treatment for individuals with major mental illness (Major Depression, Bipolar Disorder, Schizoaffective Disorder, PTSD, Borderline Personality Disorder) and addiction type problems such as bulimia, drug and alcohol abuse, and cutting. Dr. Sheets will present 3 break-out sessions. Addresses the dynamics of Emotional Mind and its role in driving destructive emotion-driven coping behaviors (e.g., substance abuse). Related concepts and worksheets will be discussed: emotion-driven thoughts, emotion-driven lies, the cycle of suffering, and the big picture of my life. Participants will understand how Emotional Mind dynamics drive destructive behaviors. Participants will recognize the similarities among various types of destructive/addictive behaviors. Addresses the role of Rational Mind and Wise Mind in recovery and the choice to utilize life-enhancing coping behaviors to deal with upsetting Emotional Mind states despite impulses to respond in destructive ways. Related concepts and worksheets will be discussed: thinking through before we do, challenging emotion-driven thoughts, looking at the big picture of the situation and our life, and the Wise Mind Worksheet. Participants will understand the role of Rational Mind and Wise Mind in recovery. Participants will gain familiarity with the use of Rational Mind and Wise Mind to work through destructive thoughts and impulses and to facilitate constructive problem-solving and life-enhancing coping responses. Discusses the development and use of a Game Plan for recovery. Special plan features include the identification of Emotional Mind “Excuses” and Rational Mind “Obstacles” (true obstacles) that can sabotage follow through with recovery steps and the use of Rational Mind and Wise Mind to challenge excuses and to problem solve to get around the obstacles in our recovery path. A sample plan for “Have Bipolar, Must Quit Drugs and Alcohol” will be reviewed. Participants will understand how the Game Plan differs from conventional treatment plans. Participants will understand the format and use of a Game Plan and its application for a wide range of recovery goals. 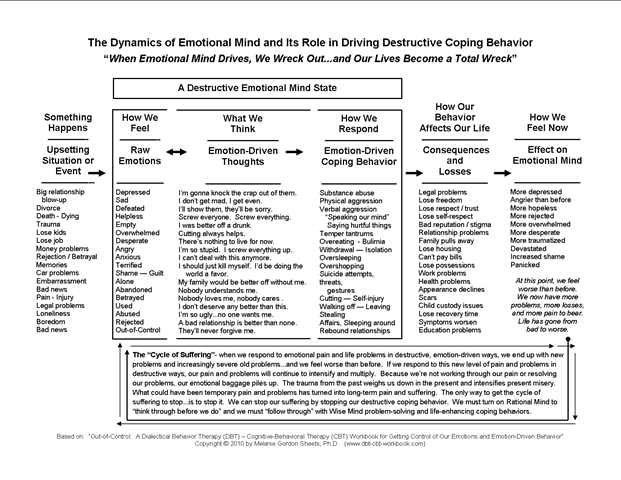 “Out-of-Control: A Dialectical Behavior Therapy (DBT) – Cognitive-Behavioral Therapy (CBT) Workbook for Getting Control of Our Emotions and Emotion-Driven Behavior” (2009) Recovery Works Publications. Please contact Jill Stephens at 432-570-3333 or Judy Craig at 432-683-3648 for more information about the conference. The cost is $15 without CEU’s and $30 with 8.0 CEU’s. NAMI Midland is located at 1204 Lawson, Midland, TX 79701.